Anirudh's World: Braveheart - thats my little boy! Yes..that's what I called him when I saw him being so brave after he got hurt on the forehead which required suturing up. This happened on Mar 23 late afternoon around 3:30 PM. He was playing with another boy who was pulling his t-shirt from behind while Anirudh was trying to run forward. Suddenly the boy let Anirudh's t-shirt go from his grip and Betu lurched forward with the impact of sudden release and bumped his forehead on the wooden chair close by. 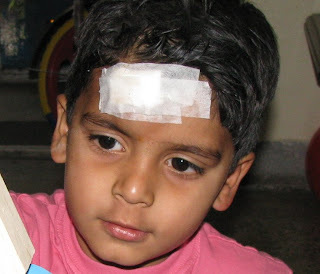 I reached his daycare by 4:00 PM and by that time he had been bandaged up by the supervisors there. They told me how brave and strong he has been throughout and how he didn't cry at all minus the initial tears at the time he got hurt. And that was not all.When I took him to the nursing home nearby, even at the time of stitching and cleaning up of the wound he did not shed a single tear. That is why I called him a brave heart while I was going weak in the knees, heart, hands, head...weak in every single part of my body. While I was still shaken up throughout the rest of the day, he was up and about like any other day playing and talking and laughing. I was also trying to smile and laugh and be normal but I knew it wasn't coming naturally to me. Every time I would look at the potato sized bump on his forehead I would get so uneasy. After we came back home me and him played with his newly bought wooden building blocks, our gift for his 5th birthday a week in advance of his birthday. The mother of the boy who he was playing with at the time of injury and the little boy dropped by our house as she was feeling a bit apologetic. Somehow I never even developed any ill-feelings towards them as it was a just-by-chance accident. They are kids and they will play. Sometimes wild and sometimes not. However I did pull up the daycare people to be careful so that the wild play doesn't go out of hand to this extent again. They were feeling quite sorry too and I knew I didn't need to drive it in their head any further. Mar 23: Few hours after the injury. Notice the bump on his forehead just above the right eye? Mar 23: Playing with the wooden blocks. Mar 26: The stitches (in blue colored thread) all dried up. Yeah that sure looks like a big bump, poor Betu. But he didn't cry that much, yes, very Brave! he is awesome, i tell ya! big hus to him! Btw, that was a big bump :-( hope he's wayyyyy better now.